Invitations are already out from the Asian Professional Exchange (APEX) re IMELDA, THE MUSICAL to be performed at the David Henry Hwang Theater, 120 North Judge John Aiso Street,Los Angeles,California on Thursday, May 12, 8:00pm to 10:00pm. To be presented by East West Players!, the US' leading Asian American theatre company, it will be a musical biography of the First Lady of the Philipines. A pre-show reception will be held at 6:00p.m. in Little Tokyo. Man" as part of East West Players' Theatre for Youth touring program ASIAN PACIFIC TALES. "Does the story of the First Lady of the Philippines go beyond the shoes? In this musical biography, an Imelda emerges aggressive, naïve and ultimately discovers that her husband’s newfound power is a means to obtain everything she was once denied. Thief or political ploy? Greed or need? The story continues to fascinate. This production was developed by East West Players and Academy for New Musical Theatre." 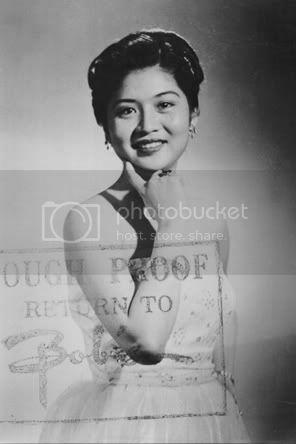 Tim Dang, East West Players’ artistic director who will also direct the production, said in an exclusive interview with Inquirer Entertainment that Imelda will concentrate on the “time when she (Imelda) ran for Miss Manila to when she and Marcos were flown to Hawaii”. Liza del Mundo plays the role of the Madame, Giovanni Jose Ortega as Ferdinand, and Myra Cris Ocenar as Cory Aquino. Will Imelda win the hearts of theatre goers like this did? Abangan!